Have you ever learned how to make apple coffee cake recipes or do you know the origination of the recipe? I know there are many stories about the origination of this sweet delicacy and why they are called coffee cakes. As with most prized foods, many countries want to claim its origination. I only can give you my personal knowledge. In my lifetime and my personal life as a young homemaker, most women around did not work. They stayed at home to raise their children and take care of the household. Maybe once a week the women with their children would gather at another house and have coffee along with “coffee cake”. Sometimes a neighbor or friend would stop by each other’s house to have a cup of coffee and a piece of cake. One job of the woman of the house was to make every visitor feel welcome in their home; being hospitable. What is hospitality in the home? In my day it was only hospitable to have something to offer a guest with their coffee. I believe that this is the reason coffee cakes became so important to my earlier generations of homemakers. Of course here in the United States apples have been one of the abundant and affordable fruits, often growing in our back yards. Enjoy the many recipes of apples like apple bread, apple dumplings and apple salad. When I learned how to make apple coffee cake recipes, at first I started with a prepared mix like this apple crunch coffee cake. This quick bread recipe is easy to prepare and very delicious. Grease and flour 9 inch spring form pan. Combine the bread mix, whipping cream and egg in a large bowl; stir until mix is moistened. Spread half of batter in the bottom of prepared pan. Top batter evenly with the apples. Combine the brown sugar, pecans and cinnamon in a small bowl and mix well; sprinkle half of mix over the apples. Drizzle 2 tablespoons of the butter over the brown sugar mixture. Drop remaining quick bread batter by tablespoonfuls over the nut mixture. Sprinkle with remaining nut mixture and drizzle remaining butter over the top. Bake 40 to 50 minutes or until pick comes out clean. 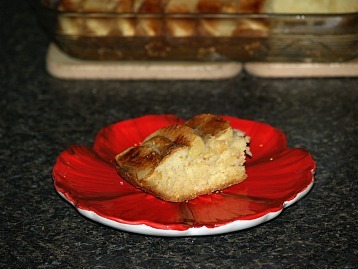 I love good coffee cakes but they are especially good when sour cream is added like in this recipe. Grease 9 x 11 inch baking pan. Cream sugar and butter together in a mixing bowl; beat in sour cream egg and vanilla. Add dry ingredients to creamed mixture and mix well; spread in prepared pan. Arrange apple slices on top of batter; sprinkle with mixed ½ teaspoon cinnamon and 2 tablespoons sugar and dot with extra butter. Lightly grease 8 x8 square baking pan. Cream ¼ cup of the butter, egg and milk; Mix in 1 cup flour and baking powder. Pat dough into greased pan. Stand apple slices closely together in the dough. Sprinkle the gelatin all over the top. Combine the other 1 cup flour, sugar and other ½ cup butter; cut with pastry cutter until crumbly and sprinkle over all. Another short cut to making coffee cakes is by using products like ready to bake biscuits; this biscuit breakfast recipe is very delicious and will be much appreciated for breakfast or brunch. 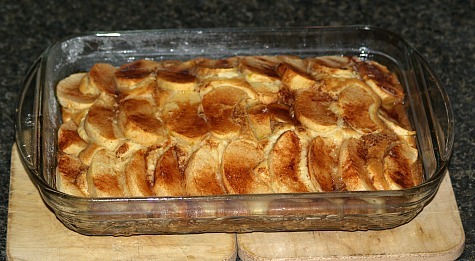 Melt 2 tablespoons butter in a 9 inch cake pan; arrange sliced apples over the butter. Sprinkle the raisins over the apples. Cut each biscuit into four pieces and place over the apples. Mix together the brown sugar, cinnamon, corn syrup and egg until well blended; pour over the biscuits. Sprinkle walnuts over the top; dot with 1 tablespoon butter. Bake in preheated oven at 350F degrees for 35 to 45 minutes. Invert on serving plate and spoon juice over the top.